Taekwon-Do is a Korean martial art founded by Grand Master General Choi Hong Hi (1918-2002). It is a modern form of self defence which was developed from other martial arts and scientific principles allowing techniques to have maximum power and effectiveness. Taekwon-Do is now taught in many countries across the world and is famous for its dynamic kicking techniques which often leads to the misconception of it being a kicking martial art. However, Taekwon-Do is also made up of blocks, punches and strikes with the hands. Taekwon-Do has a wide range of techniques to cater for many different situations including defending against single and multiple opponents, on foot and seated as well as against weapons such as knives and sticks. Taekwon-Do is made up of five main elements: patterns, sparring, special technique, power and self defence. Patterns are a series of fundamental movements performed against an imaginary opponent. Taekwon-Do has 24 patterns, each to represent an hour in the day. Patterns are the building blocks of the martial art that teach stances, and attacking and blocking techniques. They teach you to develop technique, build strength and improve concentration. Sparring is the application of Taekwon-Do techniques in a supervised and controlled environment. It is conducted between two students of varying grades using protective equipment to minimise injury. Adult sparring is semi-contact with the aim of scoring points rather than causing damage. Children's sparring is non-contact. Sparring is a good way to develop speed, stamina and reflexes. Special Technique is the use of certain jumping kicks to kick a board suspended high above the ground. These techniques build up strength and flexibility. Power involves the destruction of anything from reusable plastic boards, wooden boards or roof tiles. It demonstrates the power of Taekwon-Do techniques without involving an opponent. Self defence is the application of Taekwon-Do techniques in real-world situations. It focuses on teaching the student releases and holds in order for them to counter-attack and move away from the situation safely. Taekwon-Do also teaches students to avoid confrontation where possible. 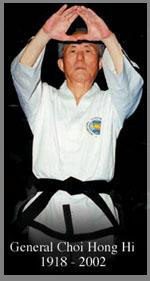 On April 11th 1955, the name Taekwon-Do was officially adopted for the martial art General Choi Hong Hi had developed using elements of the ancient Korean martial art of Taek Kyon and of Shotokan karate, a martial art he had learned while studying in Japan. The philosophical values and the goals of Taekwon-Do are firmly rooted in the traditional moral culture of the Orient. On the technical side, defensive and offensive tactics are based on principles of physics, particularly Newton's Law, which explains how to generate maximum force by increasing speed and mass during the execution of a movement. Wanting to share the results of his philosophical reflections and his technical experiments, General Choi planned and wrote a unique reference work, the Encyclopaedia of Taekwon-Do. In its fifteen volumes, he explained in detail the rules and practices of this art. Always striving for excellence, General Choi presented Taekwon-Do as in a state of continuous evolution, open to changes that would improve its effectiveness. He wrote that anyone who believes he has fully discharged his duty will soon perish. Likewise, any undertaking that is perceived to have reached its objectives is likely to lose momentum, stagnate, and die. Since the beginning, Taekwon-Do has never stopped evolving, driven by the strong will and a lot of hard work by it's Founder. The leaders of the ITF today also recognise the need to evolve and they are equally passionate about the future of the organisation.